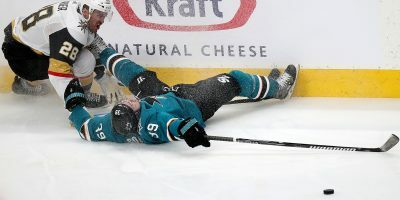 Coming off a deep playoff run and adding veterans Mikkel Boedker and David Schlemko this offseason, the Sharks don’t need immediate major contributions from their prospects. Nor did it imply the Sharks were lacking in organizational depth. Forward Timo Meier and defenseman Patrick McNally both recorded hat tricks in Team Ricci’s 7-6 win over Team Marchment, while forward Marcus Sorensen — who scored the first goal — and forward Barclay Goodrow — who had a couple of assists — were also noticeable on the ice. On the older side, the 24-year-old Sorensen fits right into the prototype of Melker Karlsson and Joonas Donskoi, both of whom spent significant time playing in Europe before seeing success at the NHL level with the Sharks. And, like Karlsson and Donskoi, Sorensen’s speed has the Sharks impressed.